As the population of the world grows, and as the internet traffic climbs, more and more people are finding and expressing an interest in coming to one of our special cabins on Orcas. Many folks come from urban areas, looking for escape, refuge, sanctuary, silence, peace. Most find these qualities; in addition, some individuals discover other elements that have to do with the experience of living in the country. These "other elements" are contact with specific components of nature, life forms that have given rise, in some minds, to the phrase "things that go bump in the night." 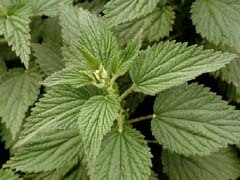 There are passive forms of nature that are unpleasant when touched, like nettles (shown in the picture here). There are active forms of nature that are also unpleasant when touched, like slugs. There are bats which can occasionally fly in an open window and then desperately search for a way to get out, silently circling the room in their erratic flight for freedom. There are bees which during a certain period of the summer can be downright aggressive. There are slippery seaweed-covered rocks. There are mosquitos...not many, but you only need one. There are garden snakes. We cannot guarantee that you won't encounter something you are unfamiliar with, such as a nettle; like a hot stove, if you touch one once, you'll never do it again. If you are looking for accomodations that virtually guarantee no surprises, no encounters with something unfamiliar, no possibility of unexpected pain (like a bee sting), consider Rosario Resort or the Orcas Hotel. We can only offer simple, honest, country accomodations; we cannot offer, and wouldn't pretend to offer, perfect weather, perfect views, perfect experiences; that stuff belongs in fairy tales or brochures--that map is not our territory. If you have any questions, please don't hesitate to write or call. We wish our guests to be totally informed about the environment we can't, couldn't, and wouldn't, control.